Natural habitat adventures and incredible wildlife experiences bring wonders of nature to your travel memories. 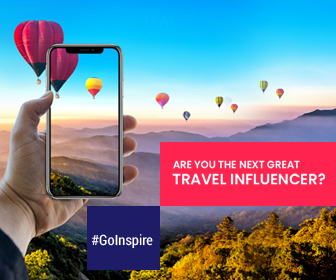 If shopping in the local souks, catching a tan on an exotic beach or traveling to a tourist trap of a city seems like a bland and boring way to spend your holiday, a wildlife adventure may sound like a more out-of-the-box getaway. This is a great starting point for those who want to plan their first wildlife watching adventure or for those who want to glide through for glimpses of wildlife gorgeousness present in the world. 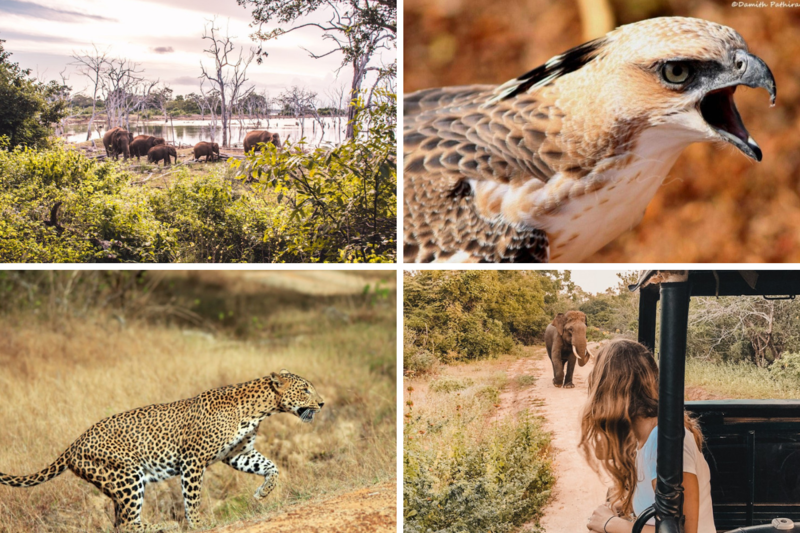 So, sit back and enjoy a couple of stunning wildlife travel suggestions and must-visit list that we brought to your sight. Obsession towards dragons could be very common for most of you, especially for those who watch Game of Thrones or The Lord of the Rings. If this is what you are, then you would love visiting Komodo National Park. This park is the country’s largest national park and one of the world’s oldest rain forests sheltering a huge number of Komodo Dragons. Besides these wonderful creatures, the park provides refuge for many other notable terrestrial species such as the orange-footed scrub fowl, an endemic rat, and the Timor deer. Moving closely with all the wildlife present on the island is a real adventurous experience one could ever get in a lifetime. Trek the park along the rough hillsides of thorny vegetation, bask on sandy beaches and snorkel the crystal clear blue waters to get a view of tropical fish, corals, and other rare marine animals – your wildlife adventure is complete. To reach Komodo Island, travel via Bali or Jakarta. Daily flights are available to travel to and fro Komodo and Bali or Jakarta. 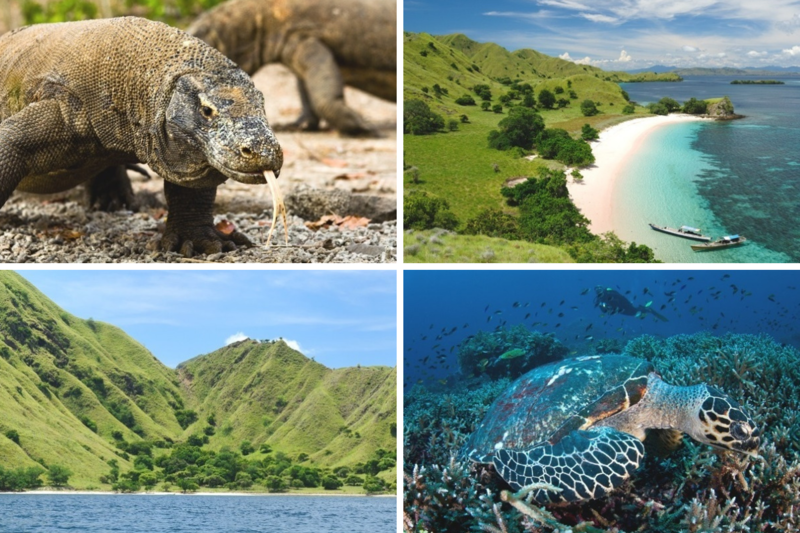 A one-day trip is quite enough to explore complete Komodo Island. Finding good accommodation on the island is very difficult. So, head back to Bali or Jakarta to stay moderate or luxury. This dramatic, mountainous region is one of the biggest tourist destinations in Oman, and spectacularly scenic. Apart from the tourist attractions of this place, it’s quite popular for the wildlife it holds. So, while visiting this place, one has to trek the mountains and explore a wide range of wildlife that includes Arabian tahr – a rare mountain goat, ospreys, terns, steppe eagles, crested honey buzzards, mountain gazelles, sunbirds, Indian rollers, and the endangered lappet-faced vulture soaring overhead. Fly to Muscat International Airport. Begin with a night or two in Muscat, and then spend the rest of your trip exploring Sur, Nizwa, the Al Hajar Mountains, and Mussanah before returning to the capital to catch your flight home. 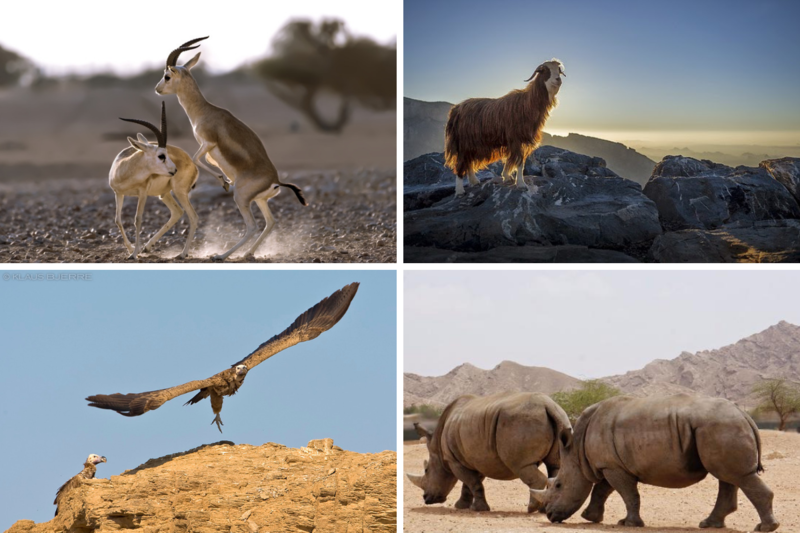 The best way to explore the wildlife is to hike the Al Hajar Mountains. Al Hajar mountain range which stretches down around 50-100km inland from the Gulf of Oman coast through the UAE into northeastern Oman. Yala National Park gives the best opportunity to witness Sri Lanka’s broad variety of wildlife. Exotic species of mammals are resident in Yala National Park. Not to mention, it has got the densest leopard populations on the globe. To list out the rest of the wildlife that this park holds you – colorfully painted storks, crocodiles, sloth bears, elephants, spotted deer, monkeys, peacocks and diverse birdlife including raptors, waders, and shorebirds. Wandering around the Yala can be possible by booking a safari assisted by a tourist guide the entire time. In this way, you can both learn about the park and have the highest chance of spotting all the animals you want to see. Tissamaharama is the main city from where you can leave for a safari to Yala National Park. Safari rides are high on demand. So, it is generally advisable to arrive either early morning or late evening to avoid waiting. 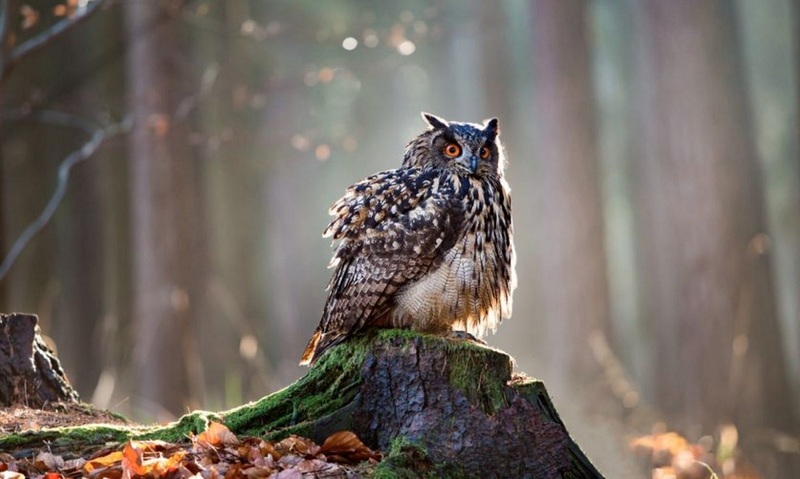 Carry a pair of binoculars to capture the views of wildlife from a distance. Stay in Tissamharama for easy access to the park. 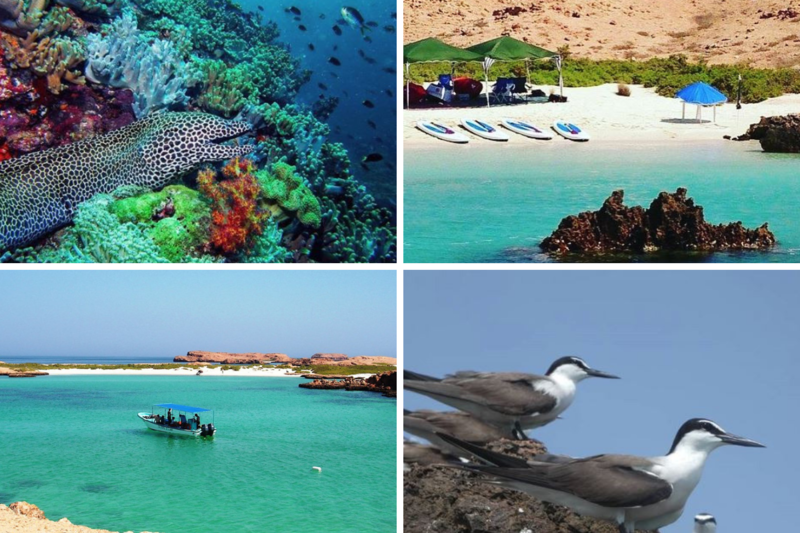 Daymaniyat Islands, located about 18 kilometers off the coast of Barka (70 kilometers west of Muscat), is home to a large number of hawksbill and green turtles, as well as a wide range of migratory birds including the increasingly rare sooty falcon and sea eagles. The Dymaniyat Islands, a string of nine beautiful islands, is one of the most beautiful diving and snorkeling locations in the Sea of Oman. Snorkeling in here leaves you with spectacular views of coral reefs, colorful reef fish, leopard sharks, turtles, and seahorses. To get to the islands, fly to Muscat International Airport and the islands are 45km away. These Islands are closed from the beginning of May until the end of October to allow animals to nest and breed. So, visiting during the remaining months of the year is highly recommended. Every year some two million ungulates – over a million wildebeest migrate across the sweeping savannah of Tanzania’s Serengeti alongside thousands of the other herbivores of Africa like the gazelle and zebra. It’s one of nature’s greatest spectacles and a highlight of any visit to Tanzania. Visiting the Serengeti offers amazing wildlife views throughout the year – spy lions, cheetahs, elephants, giraffes and leopards living in their natural habitats. 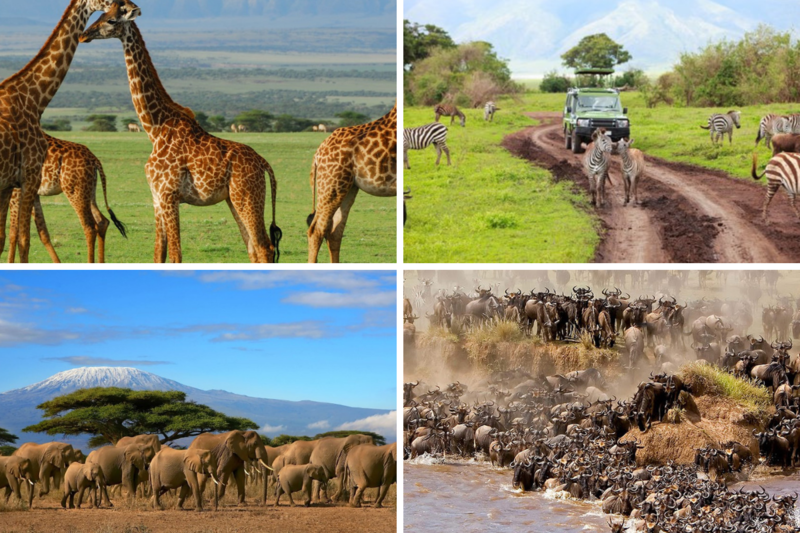 Also, you can’t miss The Ngorongoro Crater, the world’s largest inactive and unfilled volcanic caldera, which is home to a huge variety of wildlife. If you’re planning to visit Tanzania, the best airport to arrive at is Kilimanjaro International Airport (KIA). Renting a car is the best option to explore Tanzania – there are a plenty of car rental agencies that can provide you with one. The best time to see the annual migration of millions of wildebeest and zebras is February to March. The dry season (June to November) is the best time to go on safari in Tanzania since the animals congregate around the river banks. Hokkaido is often considered by the Japanese to be the country’s last frontier with only 5% of its population in there. This is a place of expansive vistas and untouched wilderness. Experience the exquisite beauty of Japan’s legendary red-crowned cranes on this winter adventure in Hokkaido. These cranes perform incredibly intricate dance in the pristine snow. Truly, it is of rare beauty and a moment you will never forget. Hokkaido’s mountainous terrain is bear country occupied by the Asiatic black bears, called higuma. To appreciate these awe-inspiring creatures up close, the best option is the Sahoro Resort’s Bear Mountain. Head up to the spot and see 40-acre reserve’s resident bears. Just incredible! 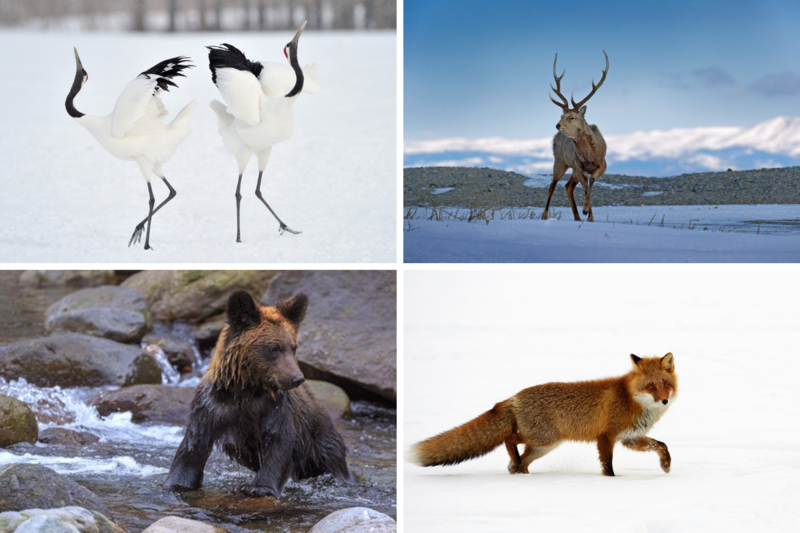 The Sika Deer and The Hokkaido Red Foxes can be found throughout many places in Japan, and Hokkaido is no exception. Explore Hokkaido by your own wheels and you’ll have the freedom to explore everything you are looking for. Kushiro also has an airport with flights back to Tokyo. Rent a car from the airport whose car rental offices are available everywhere and at every airport. Therefore, pick up and drop off the car would become easy. Taman Negara, the largest park in Peninsular Malaysia, is a perfect retreat to explore the ancient rainforest and the wildlife. At every step of your journey in the park, you could catch glimpses of Asian elephant, rhinoceros, clouded leopard and tiger. The 4,343 square kilometers national park is also home to more than 50 species of bird, many brightly colored butterflies, and an array of primates, lizards, snakes, deer, and tapirs. Observation hides- simple huts built high above the ground – are another great way to observe wildlife. These huts allow guests to stay overnight to catch opportunities to observe animals in their natural habitat. Cave exploration is also available, either by boat or by foot. How to reach the place? Take a bus ride from Kuala Lumpur to Kuala Tembeling Jetty (five hours) from where take a boat ride to Kuala Tahan (3 hours) – the tourist village near the entrance to Taman Negara. During your entire visit, you can stay in Kuala Tahan. Explore the diverse and beautiful landscapes of Ba Be as you trek through the national park. While you trek it’s very common to witness tigers, leopards, black bears, macaque monkeys, and crocodiles. If you are lucky enough you can closely watch these beasts hunting for their prey. Apart from thick vegetation and several animal species, this rainforest is also rich with bird species. Serpent eagles, the oriental honey buzzard, herons and colorful flocks of parrots – terrific! Go on foot to Bo Lu Quay where you will board a boat trip around Ba Be Lake. Throughout your entire journey on the boat, enjoy the rainbow of butterflies that flit across the sky. You can find more than 350 butterflies just adding more color to Ba Be. 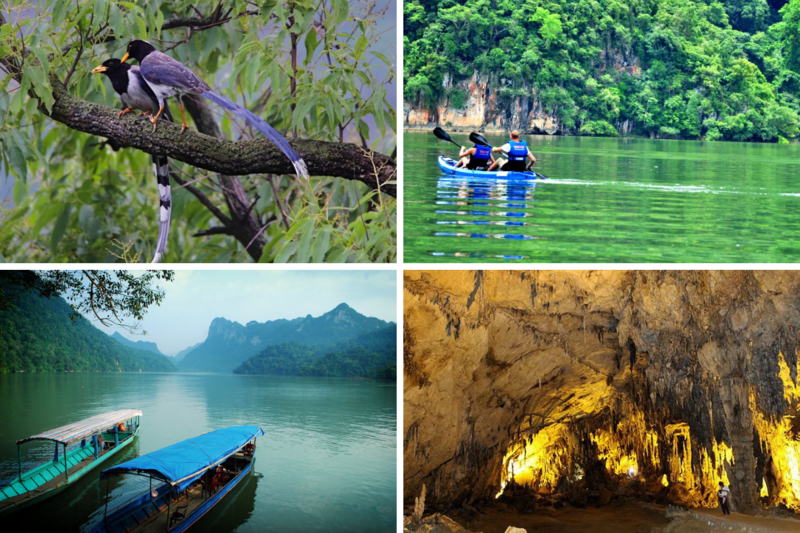 Travel Tips: Whether it is by bicycle riding or trekking, almost all the tours start and end at Hanoi. Malaysian Borneo is world renowned as a place to enjoy rainforests and wildlife, with a nice mix of accessibility to remote tribal regions. 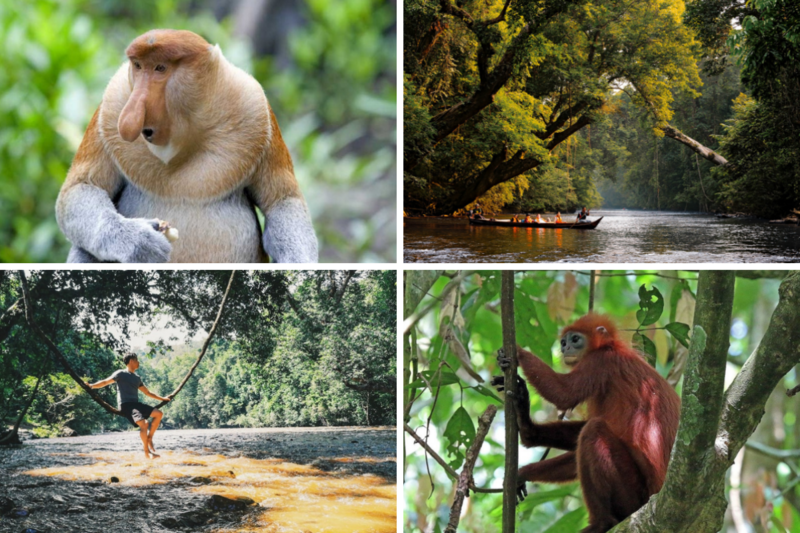 Although Borneo remains a road less traveled Borneo’s exotic creatures are hyped up and echoed throughout the world. 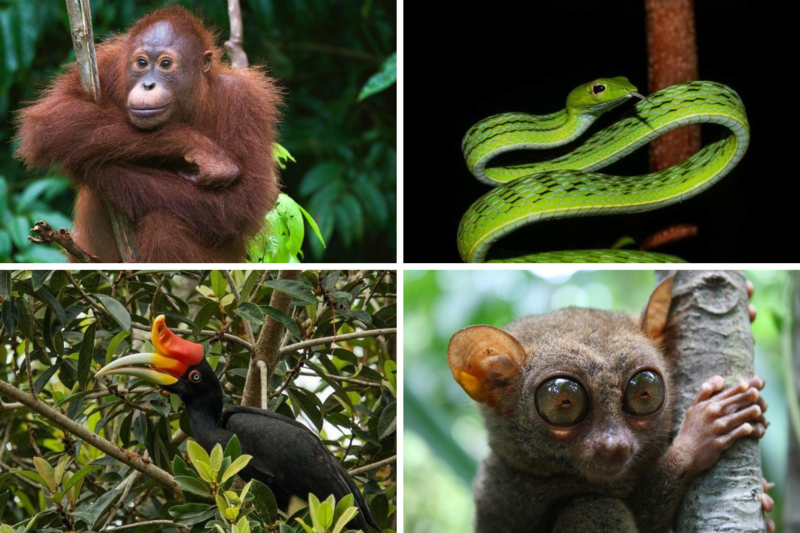 It shelters a huge array of wildlife species that include clouded leopards, tiny tarsiers, slow lorises, sun bears, and pygmy elephants. Long-limbed orangutans are the huge draw to Borneo. Borneo makes a great destination for a holiday on two wheels. Pedal around its capital Kuching then on through mountain trails, national parks, and small villages. Rainforest Kayaking is one more thing that makes Kuching for a good value. You can also head to Orangutan Rehabilitation Centre and Bako National Park to get a glimpse at one of its most famous residents – the orangutan and dozens of big wildlife. The place has luxurious lodges, remote resorts, and hip hotels. Nofa Wildlife Center is a hidden gem located just a short drive from Riyadh and is a home to a large assortment of animals. 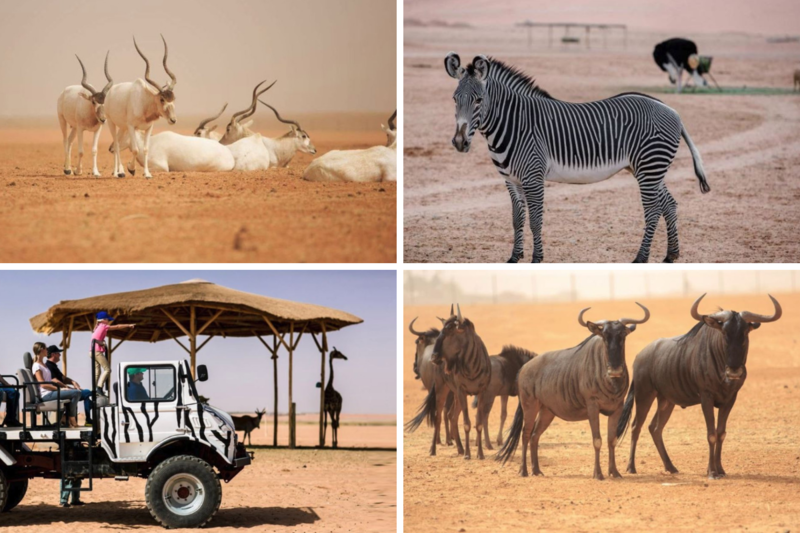 With an extensive collection of wild and desert animals such as zebras, giraffes, cheetahs, wildebeests, gazelles, ostriches, antelopes, pygmy hippos and the endangered Arabian Ibex, this place is a complete African feast in the middle of Saudi Arabia’s Desert. Explore the entire park while you set a trial on safari. To go on the Nofa safari tour you have to book in advance directly with the Nofa Resort by sending them a message. To experience the best – take a taxi or rent a car in Riyadh and drive off through Exit 857, New Mecca Highway. You will reach the place within no time.